Looking to escape the dreary UK weather with a January 2020 Florida holiday? January may be the coldest month in Florida, but temperatures still reach an average high of 22C/71F in the daytime. It’s also one of the driest months.The mild weather is ideal for wandering around the theme parks and exploring Florida’s wonderful attractions. There aren't many families with children at Florida in January – enjoy the attractions, shows, bars and restaurants without big crowds. This January 2020 Florida holiday includes a week in Kissimmee, Orlando and a week at St. Pete’s Beach on the beautiful Gulf Coast. We’ve based the price on a party of 3 adults and 3 children. Fully insured vehicle hire is included. If you’re looking for something different, let us know. We can put together a January 2020 Florida holiday to suit your requirements. The biggest expense in your January 2020 Florida holiday is the flight. For best value, avoid the first few days in January and be prepared to leave/return mid-week. If you're flexible, we can suggest the ideal departure and return dates to achieve best value. Fly direct to Orlando International or Tampa from Gatwick or Manchester. We book with the major airlines - Virgin, British Airways and United. Depending on your departure dates and airport, we’ll suggest the best choice for you. Need to leave from your local airport? We can arrange connecting flights from Aberdeen, Newquay, Exeter, Isle of Man, Belfast and Jersey. 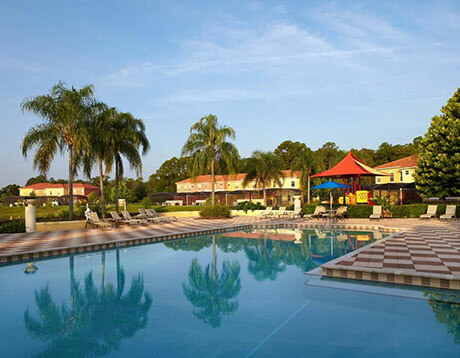 Based in the heart of Kissimmee, the beautiful Encantada Resort is ideally located for Orlando’s main attractions. Disney is just six miles away, while Universal is a little further at 18 miles. 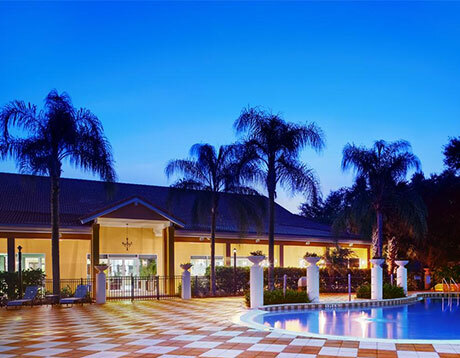 The resort features a range of 2- and 3-bedroom townhouses surrounded by tropical vegetation and palm trees. 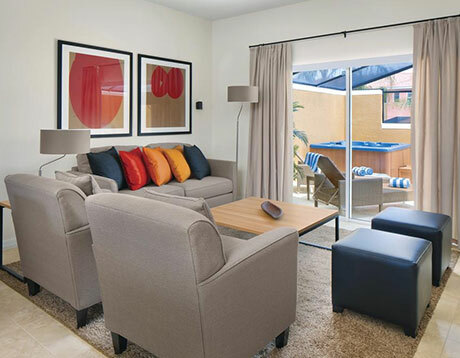 Each accommodation includes a private patio, Jacuzzi, kitchen, dining area and large TV. Furnishings are modern and excellent quality. Truly a home from home. Communal amenities include a swimming pool, children’s playground, fitness centre and even a private fishing lake. Plenty of nearby restaurants offer a great choice for evening dining. 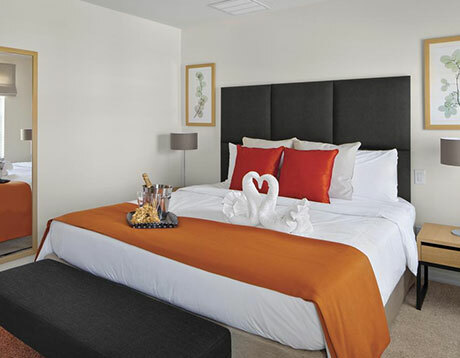 Learn more about Encantada on TripAdvisor - over 1200 reviews average at 4.5 stars. Spend your second week at St. Pete's Beach, 90 miles west of Orlando and easily reached via Interstate 4. St. Pete’s is an ideal stepping stone to the wonderful Gulf Coast beaches – miles of white sands, clear blue waters and exotic wildlife. Busch Gardens, Lowry Zoo and Florida Aquarium are all within easy reach, not to mention excellent shopping and restaurants. There’s a wealth of accommodation at St. Pete’s. Sunset Vistas Beachfront Suites are a great choice – the apartments are on the beach at Treasure Island, with ocean views of the Gulf of Mexico. Read the excellent reviews on TripAdvisor. If our twin-centre options don't appeal, let us know. We can put together the perfect Florida holiday package to suit you. This January 2020 Florida holiday includes a fully insured 7-seat minivan. Vehicles are drop-off and pick-up at the airport. This January 2020 Florida holiday is available from £795 per person, based on a group of 3 adults and 3 children. The package includes Florida flights, fully insured vehicle hire, a week at Encantada Resort and a week at Sunset Vistas Beachfront Suites. Book now with a deposit of £100 per person. Balances aren’t due until 90 days before departure, giving you plenty of time to budget. All of our Florida holidays are ATOL and ABTA protected. To book, or for more information, call us on 01934 319 851 or complete our online enquiry form. Looking for a 2020 Florida holiday but unsure which month to go? Why not take a look at our Florida Holidays 2020 page – we have suggestions for every month of the year. If you still can’t decide or don’t find what you’re looking for, get in touch. Book now with a low deposit. ATOL and ABTA protected. Easter is the most popular time of the year to visit Florida. For more information, visit our Easter 2020 Florida Holidays page and read our suggested holiday offers. Book now for the best value flights and accommodation. The best villas in prime resorts will be snapped up early. Make sure you’re at the front of the queue. ATOL and ABTA protected. Are you looking for January 2020 Florida flights? Click here for fares on British Airways, Virgin, Norwegian and United. Book Orlando flights today from £295 per person. Combine with car hire and accommodation for a terrific package rate.